Best theatre venue in Sydney? One of the best ways to spend a night is to go out to the theatre and see a play, musical or any performance. 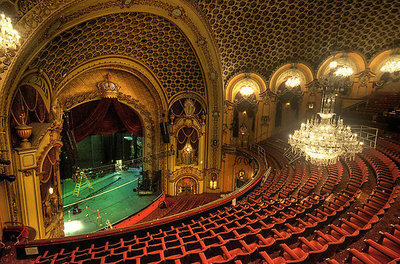 There are many beautiful theatres in Sydney, so what do you think is the best theatre venue in Sydney? The State Theatre is beautiful, elegant charms. The theatre at the MLC Centre is cosy. I love the Lyric Theatre at The Star - have been fortunate to have been to a few musicals here. I love the new Eternity Playhouse at Darlinghurst. I love the Capitol Theatre. It has an exciting vibe and combines classic decor with modern touches. The stage and seating are masterfully arranged so that audience members get the full experience, no matter where they are seated. Also, some of the best musicals are hosted there. I'm definitely a big fan of the State Theatre for the old-world charm. But it's also fun to go to the Opera House, as nothing feels quite so iconic as going up the stairs towards those big white sails. While the older theatres in Sydney have elegant architecture and rich history, Parramatta Riverside, soon due for a major refurbishment, has charms that no Sydney theatre can match. Sitting beside the river at Parramatta, with a wonderful string of restaurants and cafes along Church Street that you can eat at before the show, it has become the cultural hub of Parra. While it doesn't host the big glitzy musicals, it has a great selection of shows from Shakespeare and new works to more affordable productions of musicals performed by the wonderful Packemin company. Best thing to do at Sydney's Luna Park? Best swimming pools in Sydney?